Chasing Fireflies captures the essence of carefree, playful summer evenings. 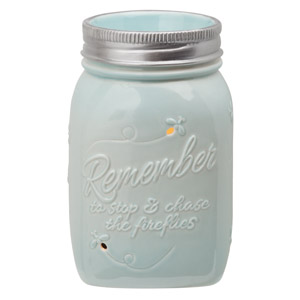 This pale-blue hand-painted warmer mimics a glass canning jar, complete with a silver ring. It is embossed with whimsical, dancing fireflies. When lit, the porcelain jar glows with a lovely warm light.